← XXL Webhosting Efficiency Boost with Antares! At last it is upon us. The crazy day when wallets feel bottomless, the body amazingly brisk, and you yourself like having the whole world at your feet. The frantic day of unrestrained shopping spree called BLACK FRIDAY! 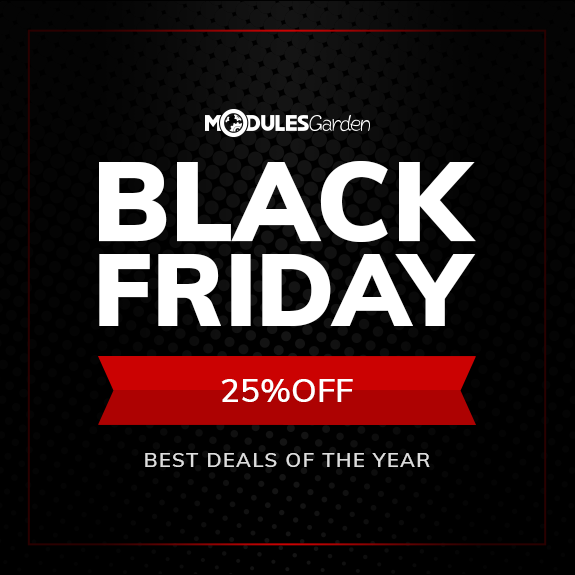 As each year, ModulesGarden goes to great lengths to satisfy your hunger for smashing bargains – just wait to see what we have come up for you this time! No matter whether you already have your eye on the specific module or extension that you will lay your hands on, or just intend to buy something on a whim – this year’s Black Friday truly special deal is going to sweep you off your feet all the same. 25% discount on every single product from our Marketplace (open source versions excluded) is now yours to exploit – just copy the below code while placing an order! We know how difficult it is to wrap up a good party. For this very reason we have decided to prolong ours until Monday! Or, as it happens, smoothly blend it into another one – the no less thrilling Cyber Monday! What time zone are you using for promo? We are using CET time zone. Happy hunting!